So you’ve decided to install a sunroom or patio for your home. While you might be focused on furnishing or the right windows, and these things are important, you should also consider what goes over your new space. At Sunspace Texas, we’re the only manufacturer who will install an acrylic roof system, whether as a patio cover or a sunroom roof. These translucent roof systems have a great look, as well as offering many benefits to you and your home. While they’re just one of several options we offer at Sunspace Texas, you may find that acrylic roof systems are exactly what you need for your home. In your search for the perfect roof system, you’ll find plenty that protect your home from harmful UV rays of the sun, but also shut out the light altogether. That’s all well and good, but if your goal is to have a sunroom, or to enjoy the outdoors, an opaque roof system probably isn’t the best option for you. Acrylic roof systems and patio covers are designed to block harmful UV rays, while still letting in all the benefits of natural sunlight. Acrylic allows soft light to filter into the space, retaining 90% light transmission. You don’t have to worry about sunburn, but you don’t have to miss out on the sun, either. Acrylic roof systems are also able to protect your home from the elements with remarkable durability and maintenance free make. While they might look light, the material is tough and designed to continue providing quality that lasts for 30 years. We guarantee 30 years, in fact, because we’re that confident in the durability of these roof systems. If you’re worried about the maintenance of your sunroom or patio, acrylic roof systems can give you one less thing to worry about. They’re smooth and not easily scuffed, so you don’t have to worry about it. It’s great that acrylic roof systems perform so well in terms of protecting your sunspace and lasting for decades, but you also want everything you choose for your home to have the right look, as well. It’s not shallow to want a cohesive look to your home that matches your style — after all, you have to live in it. Fortunately, acrylic roof systems and patio covers look great, too. They’re perfect for an open, airy contemporary look that suits sunspaces. We offer acrylic roof sheets in a range of solar tints that allow varying degrees of light transmission and heat reflection so you can customize the look of your acrylic roof system to your aesthetic needs. Acrylic roof systems have everything you could want for a sunroom roof or patio cover: they let in just enough light, look sleek and stylish, and last for 30 years. 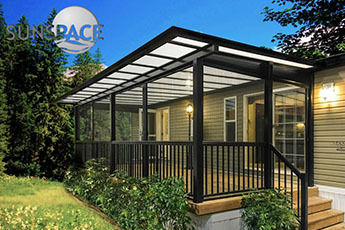 Best of all, you can have them installed along with your sunroom right here and only here at Sunspace Texas. Contact us today for more information or a free quote.